We know that Bartlesville parents what what’s best for their kids, and that includes finding the right dentist to keep their smiles whole and healthy for life. Many parents believe that means taking kids to a pediatric dental practice, but that’s not necessarily the right choice for every child. In fact, as long as your little one doesn’t have any advanced concerns during dental development, visiting a family dentist may be a better choice. At Dentistry by Design, our Bartlesville dentists and dentistry team welcome patients of all ages, and we go above and beyond to make caring for the oral health of every member of your family easy. If you’re new to the area or want to learn more about family dentistry, contact us to schedule an appointment. 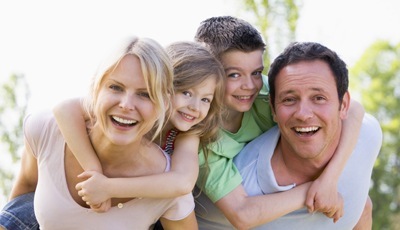 We look forward to helping you and your children with all of your oral health care needs. The first dental appointment is just a quick visit that allows us to make sure your little one is developing a healthy smile. Around the age of one or after the eruption of the first tooth, you’ll bring your child to visit us. You can hold your little on in your lap throughout this visit. We will gently examine teeth, gums, and oral and facial structures to make sure there are no warning signs of developmental concerns. 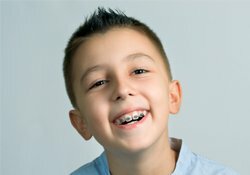 We can also provide guidance to help you with the care of your child’s developing smile. Once your little one is old enough to better understand what’s happening in our practice, we’ll take the time to let them explore the office on a tour. They can ask us questions and we’ll introduce them to all the dental tools and technologies we use. Our goal is to create a comfortable atmosphere where your child can develop positive associations with their dental care and maintain a healthy smile for life. 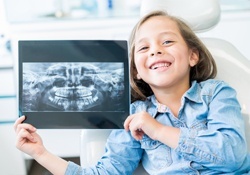 Pediatric dentistry offices are great for kids who need advanced treatments during their dental development, but for the majority of young people, sticking with the same dental team at every age is a better option. 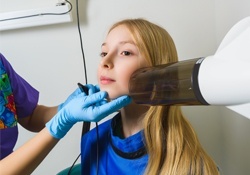 When kids visit a pediatric dentist, they can either transition into an adult practice around the age of ten or eleven, which can be stressful for them, or they can remain at a pediatric practice into their teens. Neither of these options is really ideal. A family dentist offers a practice atmosphere that is relaxed and comfortable at every age, and by sticking with the same team throughout dental development, your child’s oral health care is completely seamless from start to finish.